Leah Picking, an Occupational Therapist at Yooralla for more than 13 years, has worked for Yooralla at different stages through her career, but said she always seems to come back. Watch Leah and her manager Carmel’s stories about working at Yooralla. Leah describes her Occupational Therapy role at Yooralla as supporting children and their families to achieve their goals. “I support children and families to actually do what’s important to them. So we work and identify what’s the most important goal for them and we start from there. It might be being included in their local kindergarten program, it might be being able to access the local swimming pool or it might be working on self-feeding skills or eating at home,” Leah said. 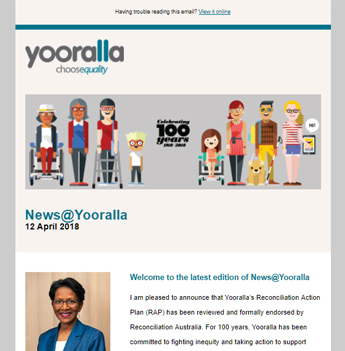 “What I like about working for Yooralla is the diversity of case load, ability to work in the family-centred practice model and supporting children and families in their naturalistic environment,” added Leah. Yooralla Occupational Therapist Leah working with young customer Thomas. Leah loves that in her role, no day is the same. “Today for instance, I’ve been to a home visit supporting a family around transition to school next year so working with a little boy with some fine motor difficulties and supporting the family with managing their decisions around getting him ready for school. Then I went on to a school visit supporting a little girl in prep who is having some difficulty accessing the curriculum, and looking at curriculum modification in conjunction with the classroom teacher and teacher assistant,” she said. Leah has found the opportunities for professional development at Yooralla to be significant. “Sometimes that might be attending courses or conferences outside of the organisation, but also working with other staff and learning from each other,” she said. Leah has worked for Yooralla at different stages through her career, but said she always seems to come back. Since returning from having children, she’s been at Yooralla for 13 years. “What made me come back to Yooralla was the type of children I was going to be able to work with and the families I was able to support, and also the fantastic multidisciplinary team,” said Leah. “When I came back to Yooralla about 13 years ago, I was looking for a job that was able to fit in with my family, and I was lucky enough that there was a position at the time. “Since then I’ve had lots of great opportunities. I moved into the Senior Clinician role, and I’ve also had the opportunity to come and work in early childhood services, and also working with some school aged children in mainstream schools. “So why do I stay at Yooralla? I think it’s for the teamwork and the ability to work, and support families with a team behind you. A lot of the time if you’re working on your own as an independent therapist it’s much harder to work and support a family with complex needs. So I think that we are able to do that really well”.